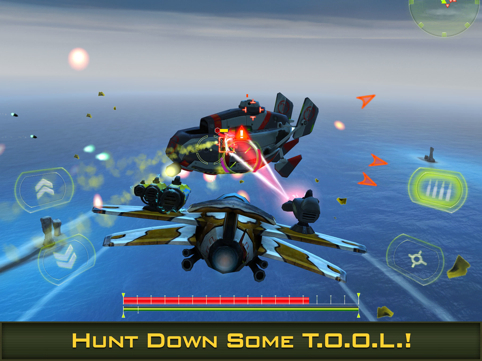 Shred the opposition with gunfire, then collect over 200 planes, cannons and missile launchers. Glu Mobile is one of the most impressive smartphone and tablet publishers, largely because it continues to offer in-depth handheld experiences at bargain prices. Next up, a cool-looking dogfight title called Bombshells: Hell's Belles. Thus far, it appears to have all the ingredients for a winner. Inspired by Glu's mega popular Gun Bros, Bombshells puts players in control of feisty female pilots as they battle their diabolical adversaries, known only as T.O.O.L. That said, users can jump into the war effort solo, or team up with friends online. Conversely, they can enjoy free-for-all as well. -FAST-PACED AERIAL COMBAT: Bombshells will take you directly to the danger zone with unique environments, devious enemies, and ridiculous power-ups. -GUNS, LOTS OF GUNS: It's simple: kill an enemy, get an item. There are over 200 awesome planes, cannons, and missile launchers to collect. Every kill is a chance at a new item! -CUSTOMIZE YOUR AERIAL ARSENAL: Combine weapons and planes at the workbench to make them even more awesome. -REQUEST SUPPLY DROPS FOR RARE ITEMS: Need that extra edge? Request a supply drop for a chance to win rare and crazy-powerful items. -COMPETE WITH FRIENDS: Real-time multiplayer and co-op multiplayer modes are available. -EARN YOUR STRIPES: Rise up the ranks on the Game Center Leaderboards.